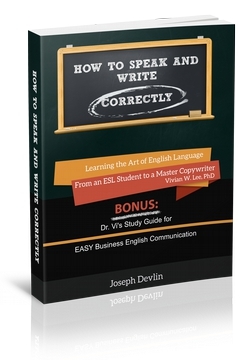 Learn the wisdom of English speaking and writing from a timeless classic "How to Speak and Write Correctly" by Joseph Devlin (1910). After more than 100 years, the original text is now professionally edited and formatted, with new foreword, introduction, epilogue and FREE infographic by Vivian W. Lee (2015). In the epilogue, Dr. Vi shares her story of learning English from an ESL student to a master copywriter. You will find her ESL story inspirational, feeling totally motivated to learn how to read, write and speak English fluently anywhere, anytime around the world. "How to Speak and Write Correctly: Study Guide"
Each includes a 5-week learning schedule, two mini quizzes, and many FREE e-Articles on self-help business writing tips online.